Instead of or in addition to generated index or archive pages, you can display posts on static Pages with the Beaver Builder Posts modules. The Posts modules give you a wide range of choices about which posts to display, how to order the display (for example, by date, author, or category), and what to include in each listing (for example, with or without the content excerpt). You can also display the list as a grid, a slider, or a carousel, with several variations. For details, see the article on the Posts modules. 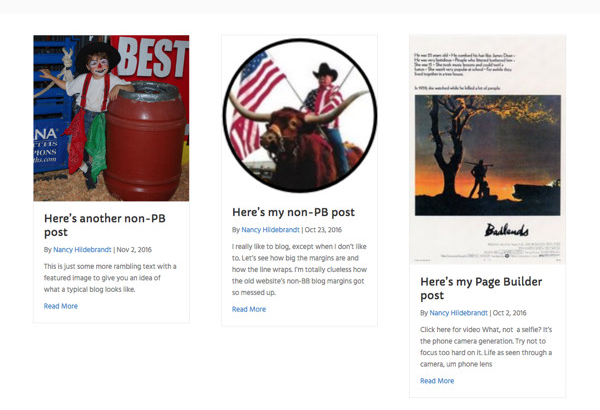 The following screenshot shows a list of Beaver Builder and non-Beaver Builder posts in a Posts module with a Columns layout. You could use this page as a more attractive substitute for a generated WordPress index page, or you might want to add a Posts module to a page containing other content. For example, on your home page you might want to display a row with a few of the most recent posts in the category of News. You can use a Page with a Posts module to simulate a generated WordPress index or archive page, but you can't put a Posts module on an actual index or archive page, because the pages are dynamically generated. See this post for an argument why it's better in some cases not to eliminate generated WordPress index or archive pages as your blog's main index or archive. Don't forget that you can also save a Posts module and use its shortcode in widgets or in non-Page builder areas of your site. 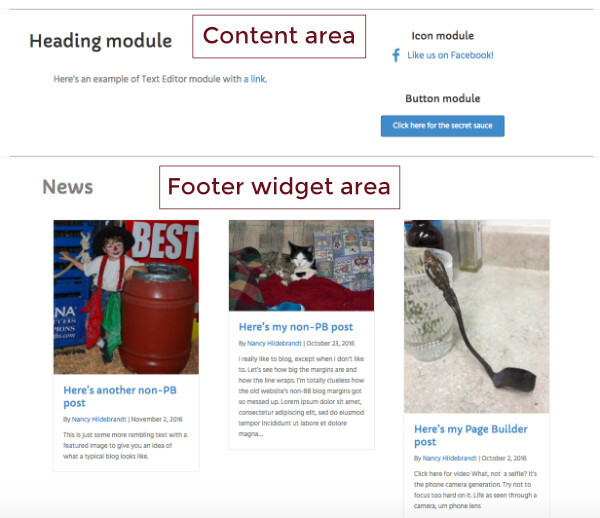 Here's an example where the shortcode for a Posts module was inserted into the footer widget layout.